Helen Smith, 99, passed away on Friday, April 5, 2019, at the Parsons Presbyterian Manor. Helen Elizabeth (Emert) Smith was born December 3, 1919 south of Chetopa, Kansas to Timothy and Marie (Hantz) Emert. She was the 6th of nine children. She graduated from Independence High School and attended Independence Community College. Her passions were her family, her church, bridge and golf. She married Meade Smith on June 18, 1938 in Independence. He predeceased her in 1987. They made their home in Neodesha when first married and lived in Wichita for several years before moving to Fredonia. She is survived by her two children; Meade (Sonny) Smith, Jr. of Fredonia and Janell (Smith) Carson (Mike) of Parsons, six grandchildren, eighteen great-grandchildren and five great-great grandchildren. She is also survived by one sister, Virginia (Emert) Baker of Dennis and sister-in-law Betty (Smith) Plummer (Mark) of Phoenix, Arizona and numerous nieces and nephews. She was also predeceased by her parents, one sister and six brothers. 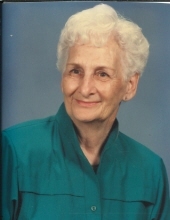 She was a member of the First Christian Church in Fredonia, WMB Club, CWF, Fredonia Golf Club and numerous bridge clubs. She worked in the offices of General Portland cement company in Fredonia for many years and was very active in her church for over 60 years; helping prepare countless dinners in the Church kitchen, preparation of communion symbols, working in the Church Thrift Shop and many other activities of the church. Visitation will be held at the Wickham Family Funeral Home in Fredonia on Tuesday, April 9, 2019 from 5:00 P.M. until 7:00 P.M.
Celebration of Life Services will be held at the First Christian Church in Fredonia on Wednesday, April 10, 2019 at 10:30 A.M.
Interment will follow the service at Fredonia City Cemetery. To send flowers or a remembrance gift to the family of Helen E. (Emert) Smith, please visit our Tribute Store. "Email Address" would like to share the life celebration of Helen E. (Emert) Smith. Click on the "link" to go to share a favorite memory or leave a condolence message for the family.